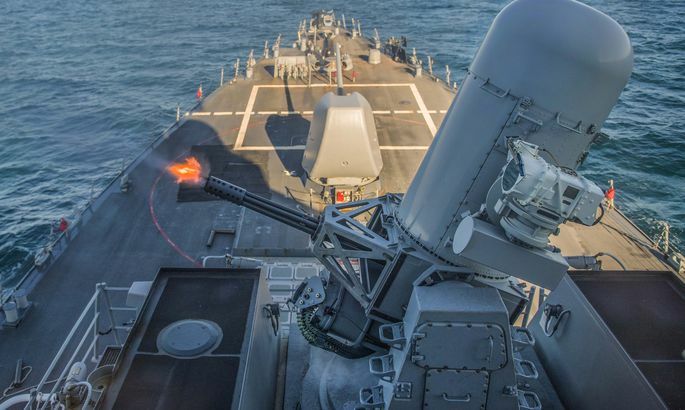 BLACK SEA (Jan. 6, 2018) The Arleigh Burke-class guided-missile destroyer USS Carney (DDG 64) fires a Phalanx close-in weapons system during a live-fire exercise in the Black Sea. Carney, forward-deployed to Rota, Spain, is on its fourth patrol in the U.S. 6th Fleet area of operations in support of regional allies and partners, and U.S. national security interests in Europe. (Photo by Mass Communication Specialist 2nd Class James R. Turner/U.S. Navy)180106-N-KA046-0195 Please note: Fees charged by the agency are for the agency?s services only, and do not, nor are they intended to, convey to the user any ownership of Copyright or License in the material. The agency does not claim any ownership including but not limited to Copyright or License in the attached material. By publishing this material you expressly agree to indemnify and to hold the agency and its directors, shareholders and employees harmless from any loss, claims, damages, demands, expenses (including legal fees), or any causes of action or allegation against the agency arising out of or connected in any way with publication of the material. В НАТО заявили об обнаружении 50 «подозрительных судов», ведущих разведку в Эгейском море, сообщает РИА «Новости» со ссылкой на греческую газету Real. Отмечается, что список кораблей был передан Береговой охране Греции Альянсом. По данным издания, речь идет о рыболовных, парусных и прогулочных судах, которые плавают в Эгейском море, собирая информацию. Также подчеркивается, что корабли-шпионы собирают информацию не только о греческих военных объектах, но и о передвижениях военно-морских сил США, которые в последнее время увеличились на греческой территории.